Medical needles are used to insert and transfer liquid medications into someone skin. Therefore the interior of a needle is hollow and the point is angled accordingly. 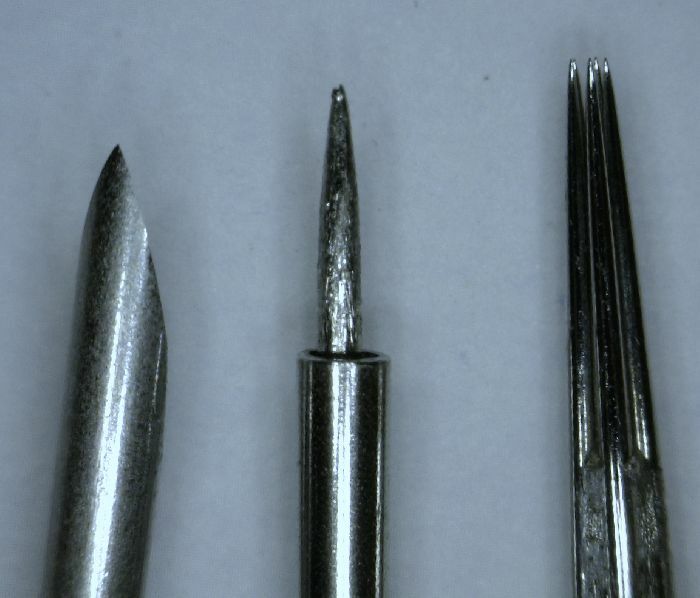 Tattoo needles come in various sizes and shapes, but most used is the 5 point needle as seen on the right. The needle is penetrated deeper into the skin (1-2 mm), as opposed to scalp micro hair pigmentation just 0.5 mm. It is clear to see that the SMP needle (middle)produced for exclusive usage by Beauty Medical trained institutes, like Prohairclinic, are quite different from standard needles. SMP needles need to be small, as real hairs are extremely small as well. Using what are most likely the smallest SMP needles in the market, we can create an extremely small pigment ‘hair dot’ that is as close as gets to real hair. The other interesting development is that the tip of the SMP needle is not smooth, but slightly abraded. This new development in SMP needles gives the pigments more ‘grip’ on the skin, creating a perfect ‘hair’ pigment at the right depth.